Freddy Bensch is passionate about his product. The head of SweetWater Brewing Company interrupts himself as he describes his brewery's recent expansion. "Do you want a beer?" he asks. "It's definitely 12 o'clock in Britain." It's 09:00 on a Tuesday in Atlanta, Georgia - a bit early for a pint. But for many in the American south-east, SweetWater is a staple. In the US, so-called craft beers made by small, independent breweries have never been more popular. "For the past 17 years, our biggest challenge was we just cannot make enough beer," says Freddy. 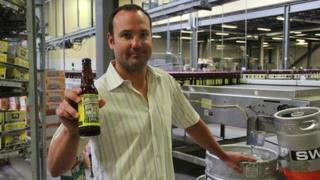 SweetWater has just quadrupled its brewing capacity with a $19m (£12m) expansion. Freddy projects the company will sell about 143,000 barrels of beer this year. While he won't reveal specific financial details, he says that would be a 30% increase on last year. But the company's success has been a long time brewing. "When we first started, we were banging on doors, trying to get an audience, getting some folks to sell our beer," the 42-year-old says. Not any more. Now SweetWater employs 83 people. After focusing on markets within a five-hour drive of Atlanta, it has just started selling beer in Miami - more than a 10-hour drive away. The company is also eyeing other states, including Virginia and Kentucky. Bensch and his co-founder opened the brewery in 1997 with a $600,000 loan from family and friends - repaid, he says, in SweetWater's first year. They built the brewery on a shoestring. "We only had three people on payroll," says Freddy. "And when you're 24 years old, you eat macaroni and cheese and ramen [noodles] anyway." Robert Gemmell, director of the International Center for Entrepreneurship at Georgia State University, says that having a Freddy Bensch level of enthusiasm for what you do is vital for any start-up that wishes to succeed. "If you're going to be an entrepreneur, pursue something you're super passionate about," says Mr Gemmell, "because the hours aren't going to make sense otherwise. It's got to be a passion - almost an obsession." Fellow brewer Kathy Davis has an unusual background for someone in the beer industry - she used to be a nun. As passionate about brewing as the team at SweetWater, Kathy was a nun for two years when she was in her early 20s. Now 36, she is preparing to open her microbrewery Abbey of the Holy Goats, the name being a reference to her former life. Kathy, based in Roswell, Georgia, first got into brewing five years ago, when her parents gave her a home brew kit. "I think anyone who ever aspires to open a brewery has, at some point, brewed in their house before," she says. "It kind of let me know that I loved to brew." She now brews beer professionally at home, where her cat Edward has been known to knock down and break several beer glasses. She uses hops grown in her garden. By telling neighbours and friends about her project, and letting them taste her beer, she has piqued local interest - including a funding commitment from a venture capitalist in her neighbourhood. Kathy says she gets pleasure from both sides of running a brewery. "I enjoy brewing, and I enjoy the business aspect. "It's really fun to see a business growing. It just came from this little, bitty idea on my stove-top, when I first learned to brew, and was looking to get into opening a business." Armed with a business degree from Georgia State University, Kathy has sought advice from the college's entrepreneur centre. Overall, she says, the biggest lesson she has learnt throughout the whole process of setting up a professional brewery has been "networking, networking, networking". Kathy adds: "I love the different aspects of marketing, with operations, and community involvement. I'm really big into that. "This really is my baby, and it's very exciting to me." Back at SweetWater, Freddy Bensch says he started out washing kegs while in university in Boulder, Colorado, in what he calls the start of the craft beer movement. From his first job, he was hooked. "The business is awesome because you get the creative style, almost like a chef, being a brewmaster, and creating different styles of beers." His advice to fledgling entrepreneurs is to be passionate. "Be sure you know what you're getting into, because it's a tough business," he says. "But at the end of the day, it's a wonderful business."